The June 2013 issue of Tabletalk features articles examining faith and repentance. The words “faith” and “repentance” are misunderstood by many people, including a large number of professing Christians. Skeptics caricature faith as the opposite of reason. Richard Dawkins, for example, has defined faith as “belief in spite of, even perhaps because of, the lack of evidence.” Repentance is sometimes seen by Christians as optional. 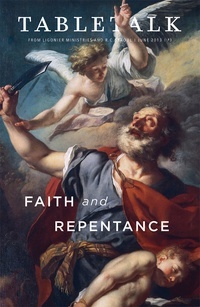 Because faith is central to the message of the Bible, and because faith and repentance are demanded of all who hear the message of Christ, it is necessary that we come to a true understanding of the meaning of these words—not in order to increase our vocabulary, but in order that we might trust and obey the living God. Contributors include R.C. Sproul along with Guy Richard, Sinclair Ferguson, Joel Beeke, Keith Mathison, R.C. Sproul Jr., Trip Lee, Douglas J. Moo, Cal Thomas and Abdul Saleeb.